These first-grade rawhides come from ranch-raised red deer so they are clean without bullet holes. These average 18 to 20 square feet, bigger than wild red deer, which average about 15 sqaure feet. They are sold by the hide. One hide is measured to be 64.25" long, 45" wide at the top, 42.50" wide at the middle, and 52" wide at the bottom. It weighed 4.50 lbs. 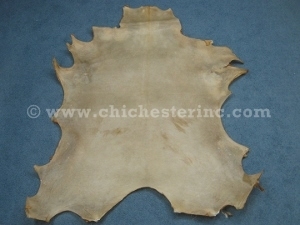 Red deer rawhide is thinner than elk. They are a bit thicker than white tail deer rawhide, but are still more similar to that in thickness than they are to elk.